Somewhere on the way from Northridge to Riverside, the University of Hawai’i lost something it couldn’t afford to lose on the road. Defense. In a performance head coach Eran Ganot described as “atrocious,” the Rainbow Warriors had its worst defensive showing of the season in a 75-71 loss to UC Riverside on Saturday at the SRC Arena in Riverside, Calif.
UCR shot 53.7 percent from the field and made 13 3-pointers – both statistics are season-highs for a UH opponent – in ending the Warriors’ five-game winning streak. 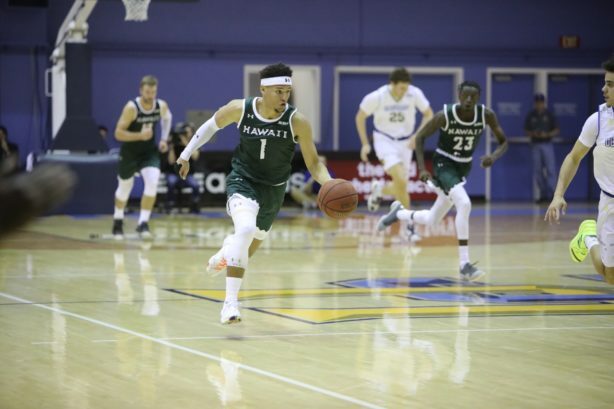 Hawai’i, which could have moved into first place with a win, dropped to 11-6 overall and 2-1 in the Big West Conference. The Highlanders improved to 7-13 and 1-3. In contrast to its defense, Hawai’i’s offense was efficient. 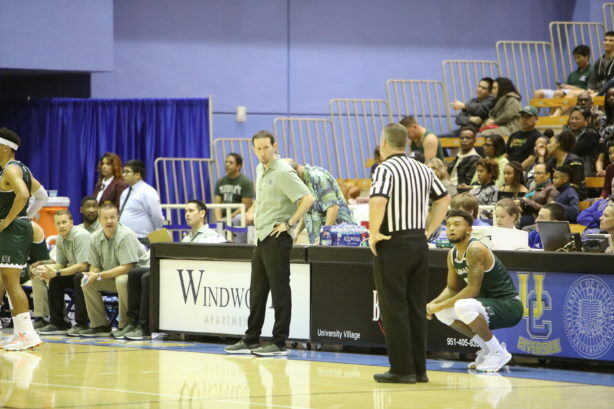 The Warriors shot 55.8 percent from the field (29 for 52), 37.5 percent from 3-point range (9 for 24), passed for a season-high 25 assists, committed just nine turnovers, and out-rebounded UCR 28-26. The Highlanders went 29 for 54 from the field overall, and 13 for 25 (52 percent) from 3-point range. Jack Purchase led the Warriors with 24 points. He shot 10 for 15 from the field, including 4 of 9 from 3-point range. He now has 163 3-pointers in his UH career, and trails only Zane Johnson (180) and Predrag Savovic (178) in the school’s record book for 3-pointers made. 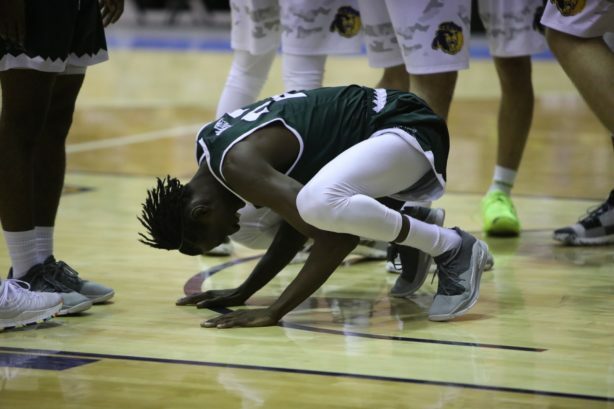 Sheriff Drammeh added 17 points and eight rebounds, Drew Buggs contributed nine points, nine assists and six rebounds, and Zigmars Raimo scored nine on 4-for-4 shooting for Hawai’i. Eddie Stansberry, UH’s leading scorer entering the game, finished with two points and shot 0 for 5 from 3-point range. He had hit at least one 3-pointer in every previous game this season. It started out well for the Warriors, who led by as many as 11 points in the first half. Hawai’i hit nine of their first 11 shots from the field to open the game, and held a 21-13 lead at that stage of the game. Hawai’i had a 26-15 advantage midway through the first half. UCR maintained the lead for the entire second half. The Highlanders led by as many as eight late in the game, but the Warriors rallied to make it close. 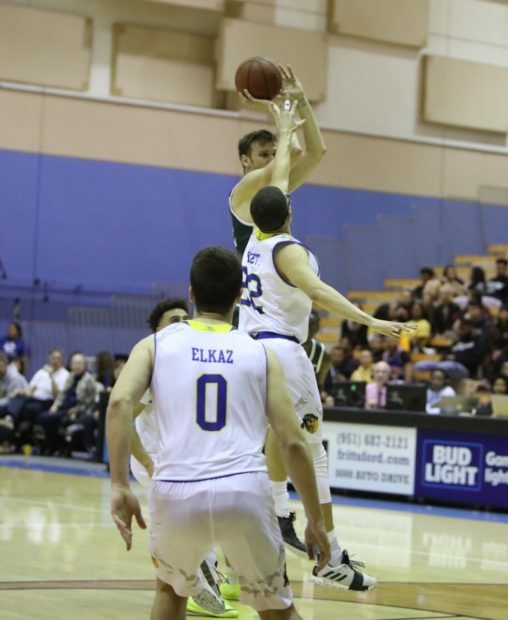 The Warriors trailed 64-61 with less than four minutes remaining, but UCR’s Dragan Elkaz completed a four-point play – he drained a 3-pointer, got fouled, and made the ensuing free throw – to give the Highlanders a 68-61 advantage with 3:44 remaining. Still, the Warriors got within two, 70-68, on a junper by Purchase with 2:05 remaining, but Dikymbe Martin scored on consecutive UCR possessions to seal the win for the Highlanders. Elkaz, a UCR freshman from Australia, scored a game-high 25 points, including 7 of 10 shooting from 3-point range. Martin added 19 points on 8-of-10 shooting, and five assists. The Warriors are scheduled to return to Honolulu on Sunday, and will play their next four games at home. The next game is on Wednesday, January 23, against UC Irvine.